Often it is advantageous to provide foundation waterproofing from the outside. 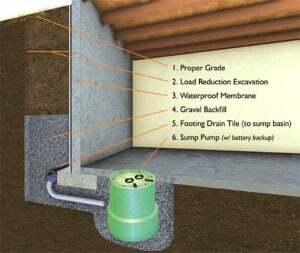 This approach helps to prevent water intrusion into the foundation at all. This means excavating the foundation wall from the outside and down to the footing. As you might imagine, this is a more involved process and does cost more, but to create a water tight basement (ie: reducing or eliminating reliance on internal drainage solutions), approaching waterproofing from the outside is required. Once the trench is dug to the footing, the wall is cleaned and we fill any external cracks or defects in the concrete, then apply a waterproof membrane. Next we will typically run a new footing drain tile (pipe) to the sump pump. To complete the project, we backfill a portion of the trench with gravel. Because gravel does not have the expansive characteristics of dirt and clay, this reduces the amount of pressure directly on the wall, which often addresses some of the key underlying problems. Finally, we replace dirt and ensure there is sufficient negative grade away from the foundation. A new sump pump is often indicated, as the load reduction system relies on water which reaches the footing to be pumped away from the foundation by a sump pump. Having a strong functioning sump pump is a critical aspect of the system. There are some instances where we may be able to run the drain to daylight or use an existing sump pump, however, this will be assessed by your evaluator prior to developing the repair plan. Internal crack repair is often indicated to seal up the cracks on the inside foundation. Visit our web page on these services to see the different options we have available to help seal internal foundation wall cracks. When we have the wall excavated, we are able to perform a “wall push” which will take a wall which has bowed, or leaned in, and return it to a plumb position. This, obviously, returns a significant amount of the structural integrity to the wall. Your evaluator will measure to see how much the wall is leaning in and, based on this, be able to indicate if the wall straightening (push) procedure is necessary. Wall bracing can also be a part of the process as well. If the wall has experienced significant movement, it often makes sense to reinforce with wall beams and/or other bracing mechanisms. The goal here is to make sure that your foundation wall stays straight in the future and is protected against the inward pressures, bowing, and leaning in the future. Again, your evaluator will assess which of these add on products and services will be of benefit.